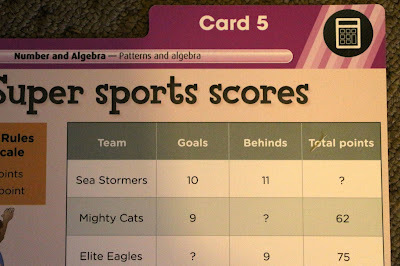 It's time for Part 2 of my review of the RIC Maths Box. As a recap, you can click on the link below to read more about the organisation of this resource and what is included in the Teachers Guide. 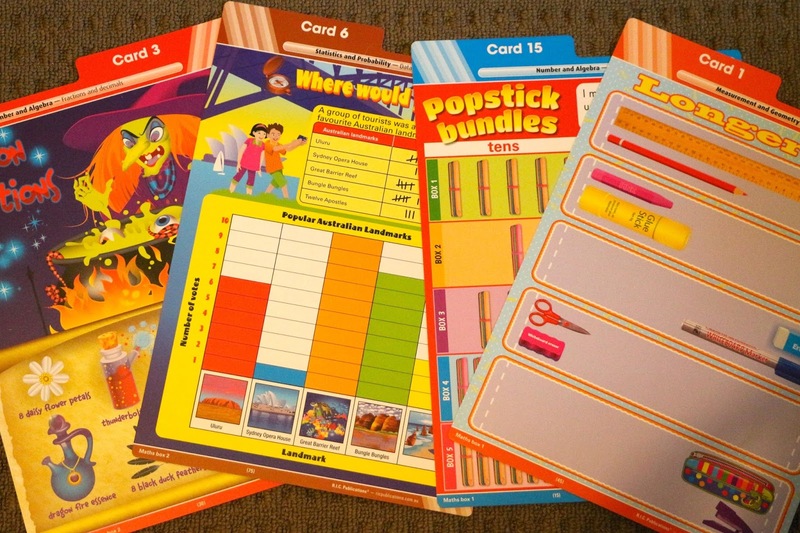 In this section for the review, I will look more closely at the activity cards and the types of activities you will find. I received a sample of each year level during the week so I can discuss different year levels also. 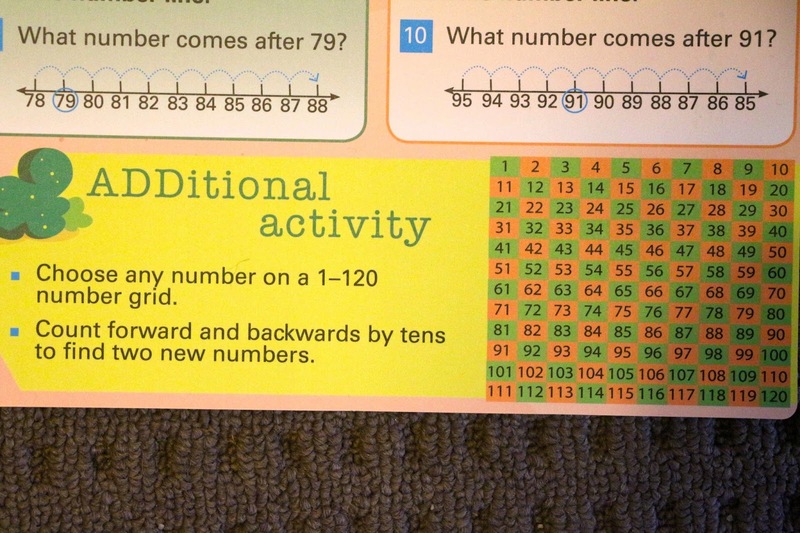 There are 75 Activity Cards in the Maths Box. Each activity is specifically written for the Australian Curriculum and as mentioned in Part 1, each Australian Curriculum link is documented in the Teacher Guide to make it easy for teachers. Each section is a different colour, has corresponding tabs and is clearly numbered. 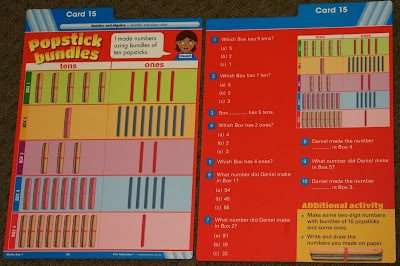 I assume the number of cards changes per box, as naturally "Number" is such a huge focus of our teaching in the Early Years. There is a great mixture of activities in each section. 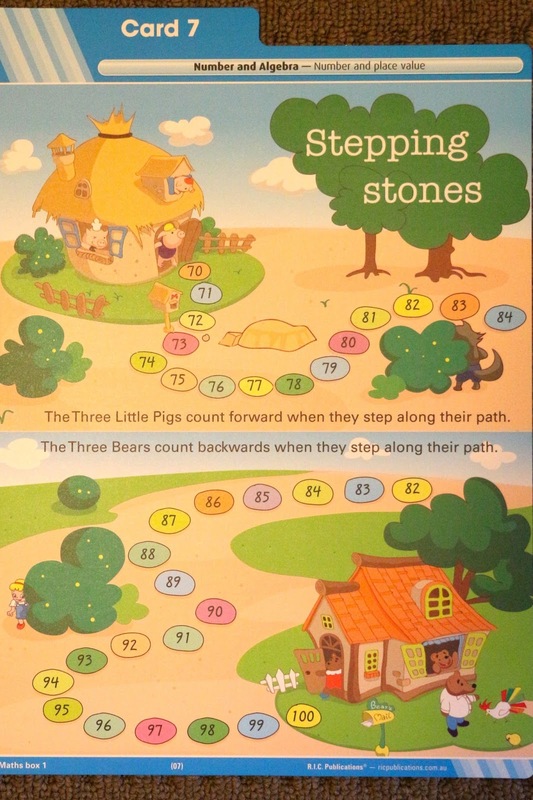 As it is directly aligned with the Australian Curriculum I don't feel there are any double ups. Each activity is a stand alone activity and could potentially be completed in any order. 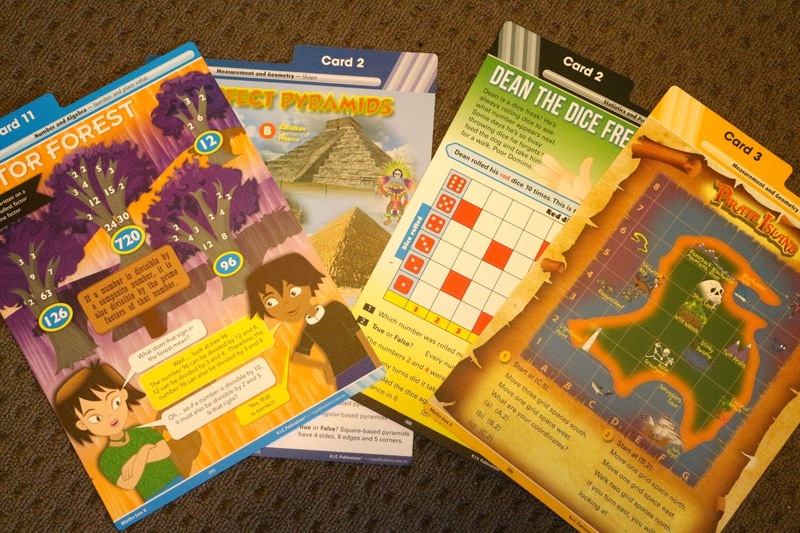 On one side of the activity cards are images or game boards and instructions. On the other side are questions. Here is an example of an activity card from Number and Algebra - Number and Place Value from the Year 1 box. Activity Card - colourful and engaging and easy to read. Question Card - 10 questions for younger children, older year levels have more questions. Each question is easy to read and understand. Younger children may have difficulty reading the questions, however, a teacher could read questions, parents or teaching aide. Activities could easily be completed as a whole class with children providing verbal responses. 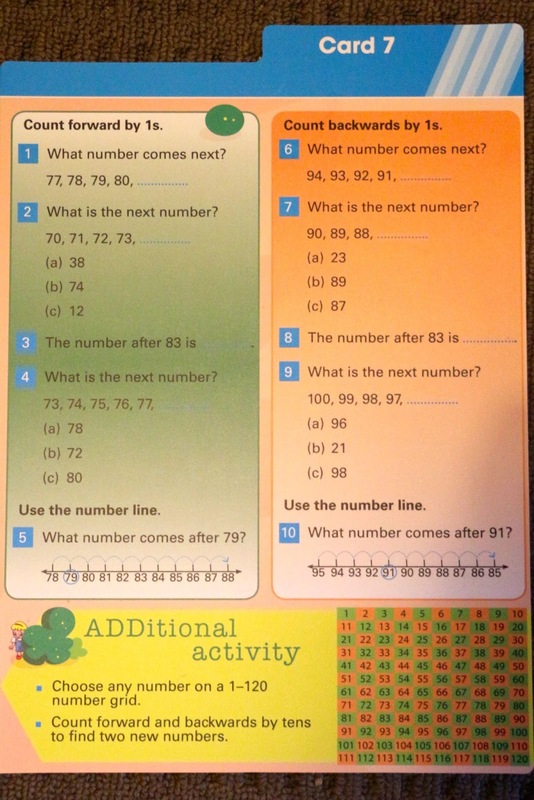 I don't feel answer worksheets need to be printed at Year 1 for each activity. 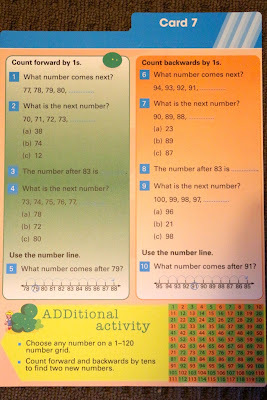 In my classroom, I would teach the children how to record the answers in their Maths workbook to save paper. 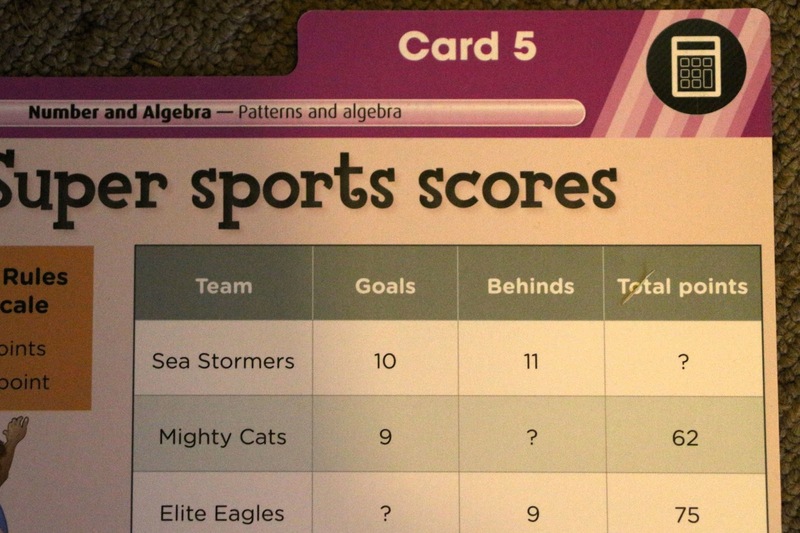 I will discuss how I would use the activity cards in my classroom in more detail in my next blog post. An opportunity to extend the activity is included on each card. Some of these activities are independent and others are partner activities. 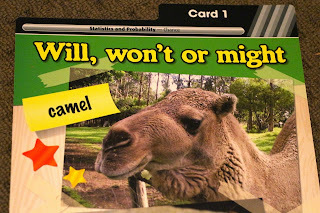 Cards that require additional materials have a logo on the top right hand corner. 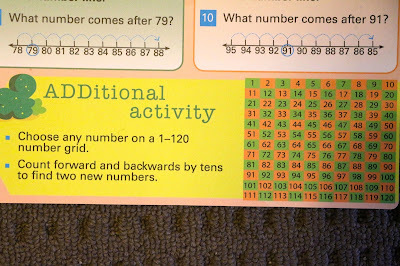 This activity obviously requires a calculator. Activity cards have cartoon images, real coins, real clocks and photos. Each card is colourful and engaging for students and each of the 75 cards is different. 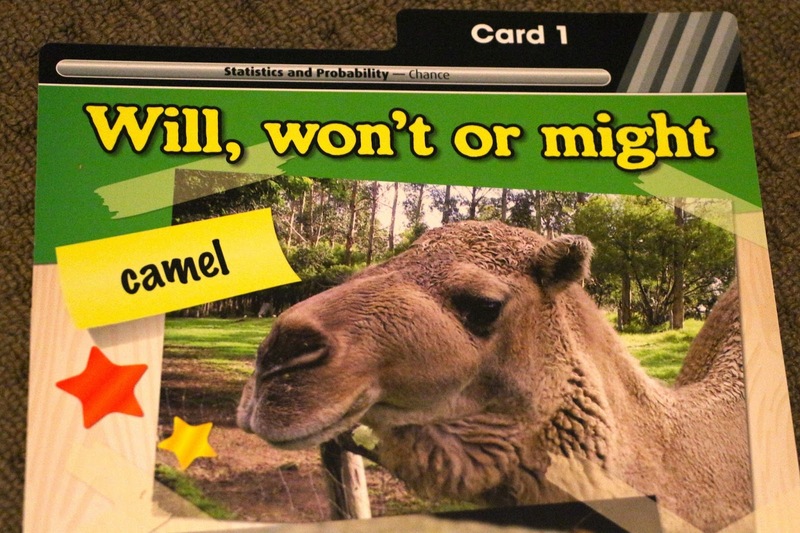 As discussed last week, each card is very durable and would not need to be laminated. In the past, one concern with these sorts of packs are that sometimes they are perfect for younger year levels, but the older ones are not practical - either the activities seem babyish (cartoons and questioning hasn't taken the age of the students into account) or they are boring. I have bought a book for Grade 3/4 students, used it all year, then changed year levels and bought the book. The book for the other year level just doesn't meet the same standard! 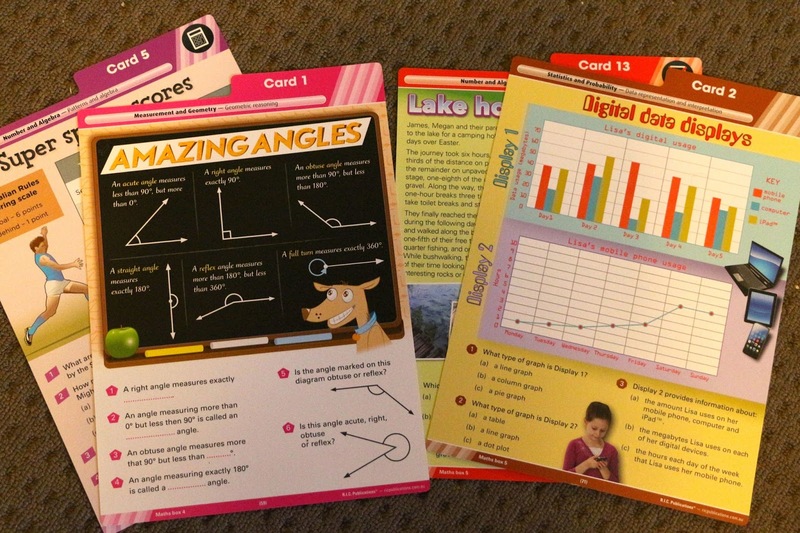 This is definitely NOT the case with the MATHS BOX - I was surprised at the differences between the cards and clearly the age of the children has been taken into account. These cards are Year 4 and Year 5. From the sample I have been given, the activities are real-life examples. The Grade 5 Fraction card discusses children going on a holiday and tests both reading and maths. The other Grade 5 activity is about digital usage and mobile phone use (something every student could relate too). 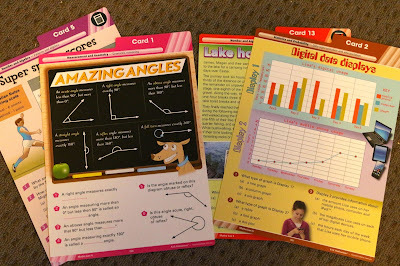 The Year 4 cards are about angles (very easy to understand) and sports scores (something many children look at regularly on the internet or in newspapers anyway). These cards are Year 3 and Year 6. I was immediately drawn to the Year 6 card about Pyramids where real life examples of ancient pyramids are shown. The questions relate to nets so it is great that the children can see real-life examples. As soon as I looked at the Year 3 cards I knew the students would have so much fun completing the activities. I was send a Pirate Island (students love grid work, especially when pirates are involved) and questions about a dice game (another favourite from my classroom). These cards are Year 2 and Year 1. The cards are colourful, easy to understand and have purposeful activities. One thing that I knew would be awkward for our longer students was the fact that the instructions and the activity cards are back to back. It means they would need to flick back and forth all the time between front and back. One way to get around this is to use both sets of cards at once. If using as a whole class group, you could easily take a photo of the activity card using the document camera and display on the IWB, then read the questions aloud. Stay tuned for The MATHS BOX! 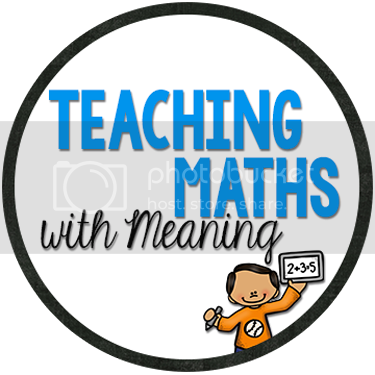 Part 3 coming this week, where I will tell you about how I would use the Maths Box in the classroom. 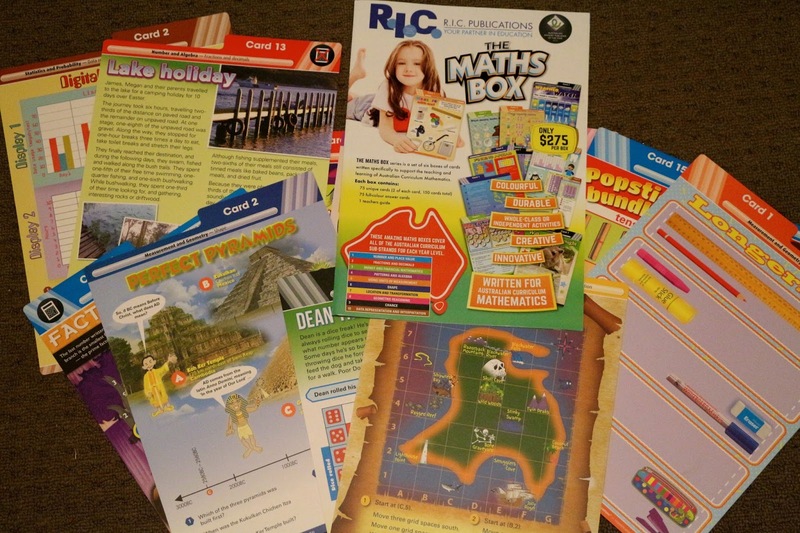 By contacting RIC Publications here you can review a FREE Maths Box sample pack for your school. Here is what is included in the FREE sample.